April is National Distracted Driving Awareness Month, which is why it is important to highlight that distractions behind the wheel are not just limited to cell phone use. If you were recently involved in an auto accident in Hernando County, you may have noticed the other driver chomping on a cheeseburger while driving. You may have noticed this because the driver was weaving in and out of his or her lane or just seemed to be more focused on that burger than the road. Regardless of why you noticed the driver eating, it is an important detail to remember if you are trying to recover damages for your auto accident injuries. 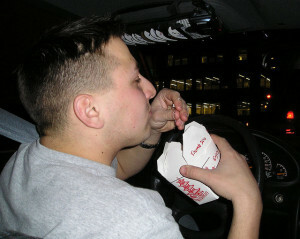 Eating while driving does all three of the above. The major issue with eating and driving is that it occurs so frequently. According to the National Highway Traffic Safety Administration, nearly half of drivers eat or drink when behind the wheel. The NHTSA also noted that only 17 percent of people believe that eating and driving poses a serious danger to those on the roadway. If you have been hurt by a distracted driver, this includes a driver who was eating at the time of the accident, you may be able to recover damages for your injuries. First you must prove that the driver was negligent or distracted at the time the accident occurred. If you noticed that the driver was eating or engaging in any other distracted driving behavior, such as texting, talking on the phone, applying makeup, etc., then you should mention these details to your Auto Accident Attorney who can help you pursue just compensation for your injuries. A Hernando County Auto Accident Injury Lawyer at Whittel & Melton can help you file an injury claim after you were involved in an accident with a distracted driver. For a free case evaluation, please call us today at 352-666-2121 or contact us online.